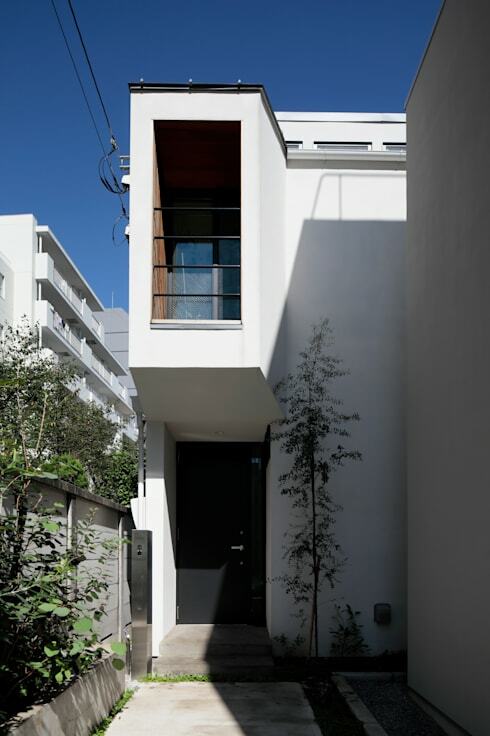 First up we see a very narrow porch and front door, and little space to work with (or so it would seem). From the outside we might not be expecting much! But then we gaze up towards more possibilities with the tiny balcony window feature. There must be more, we think. The little tree shooting up beside the front door adds character to this tiny shaded pathway. A tiny water feature such as a bird bath with water fountain would add a little bit of Zen, and a place to relax outside the apartment. 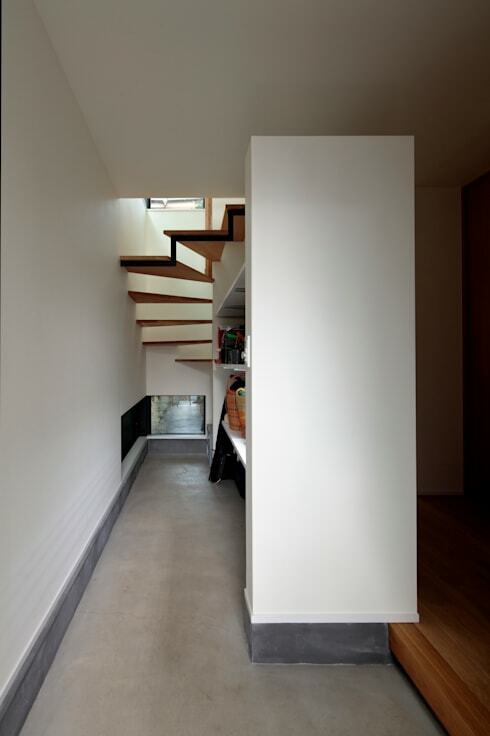 A clever architectural feature allows storage space to be created on the right, as well as light to enter through tiny square windows above and below the stairway. This is the concealed stairway we couldn't see from the outside. The area is painted in white which reflects any available light, making things much brighter. The top of this stairway is like reaching the top of a mountain! Space, light, and views. We are out of the confined downstairs area and into a real living space. Notice the delightful hanging carousel replete with little fishes, and the houseplant in a white clay pot to match the wall colour. 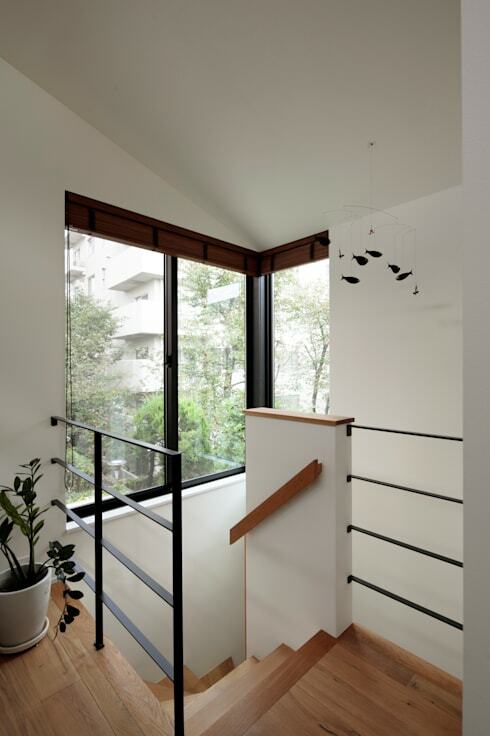 The wooden flooring is very Scandinavian, while the black railing and window frame nods more to a Japanese aesthetic. This is a landing to be proud of! Stepping back from the landing, we're presented with a larger view and can see that this is a complete living area. 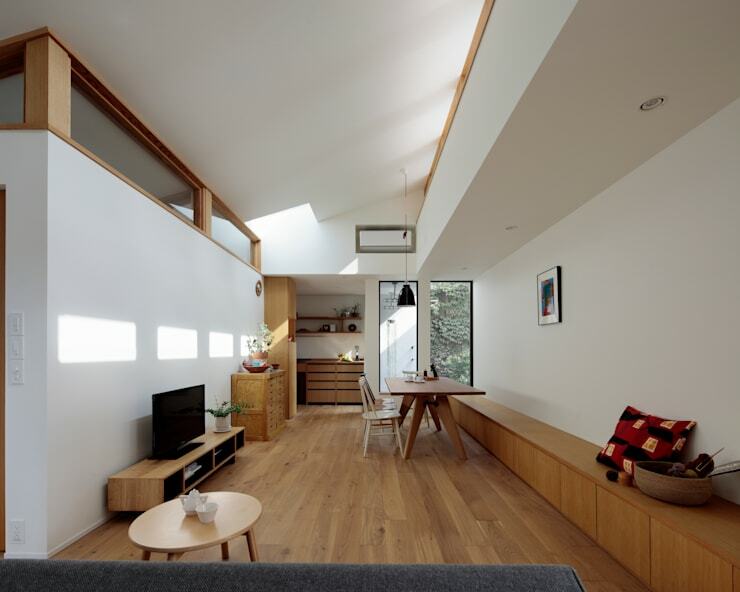 There's a traditional Japanese feel to this room in its use of black and white and wooden flooring. Furniture is low to the ground, and as always, we have plants and flowers to let nature decorate as well as paint. 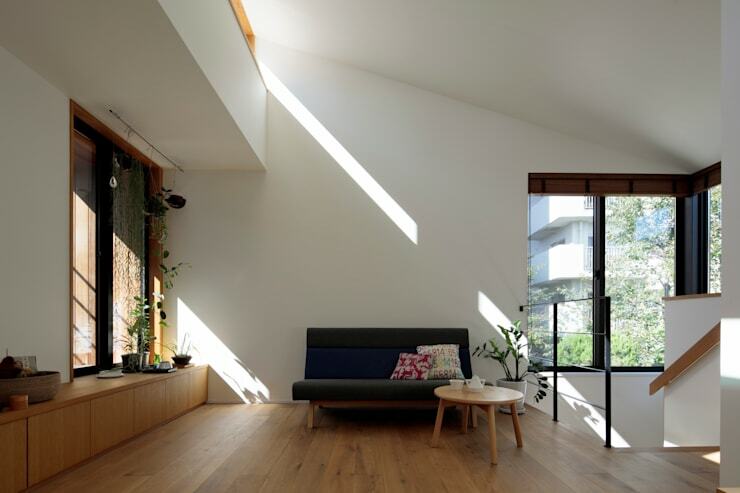 Light is permitted thought the window high above, and of course, through the large corner windows. Would you have expected such a high ceiling when standing at the front door? 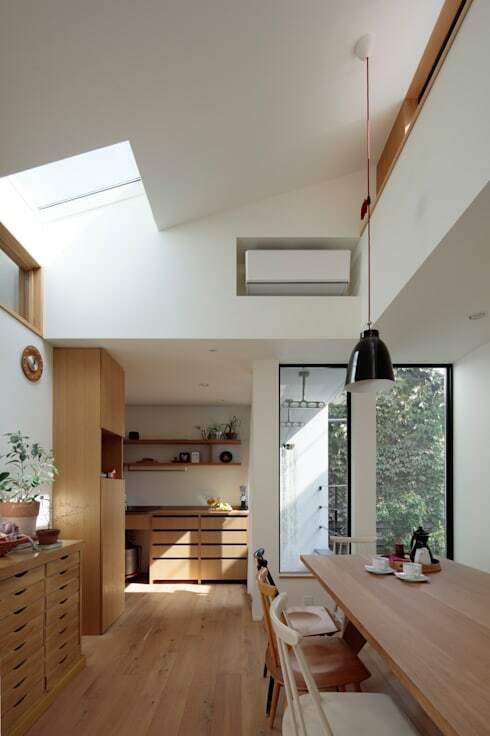 The dining area is bright thanks to its abundant windows, which also reveal a small balcony. Wood is the choice of the interior designer, and works well in creating a natural and relaxing atmosphere. Lights with glossy black shades complement the white walls and black tea pot. Again, we observe the use of greenery in keeping the atmosphere fresh. Small and practical, stylish and modern. 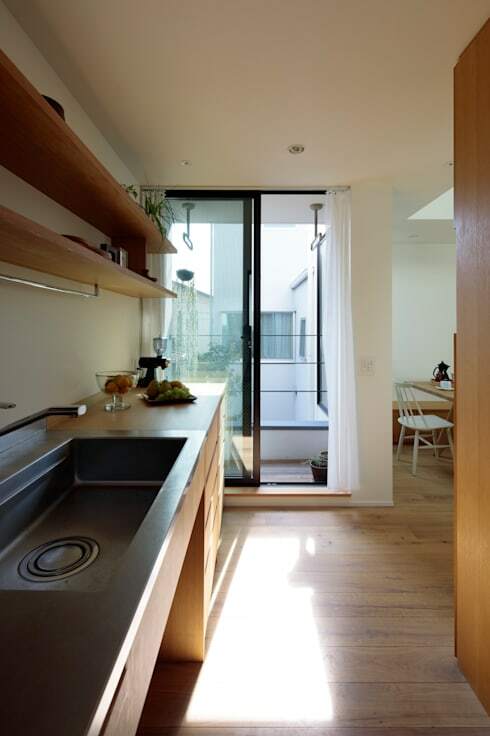 Easy to clean with lofty storage space and a cute little balcony for light and fresh air. What more could you ask for in a modern apartment in the busy city? Did you think the inside of this apartment would be so spacious?